Every year, thousands of people are injured while falling down stairs. All too often the victims of this type of fall are under the mistaken impression that he or she is at fault for the accident, when in fact it might not have been their fault at all. Unaware of their rights, victims of falls are often left with mounting medical bills they can’t pay. They miss time from work due to the injuries sustained in the fall compounding their financial stress. Too many times, their relationships suffer because of the pain of the injury and the stress over how to pay the bills. All of this happens because they are unaware that they could have the legal right to be compensated for their suffering. Since knowledge is power, it is vital to anyone who has suffered a slip and fall accident or has fallen down stairs to contact an experienced premise liability lawyer like the attorneys at Burns & Jain. These attorneys have the knowledge to help you determine whether or not you should file a premise liability lawsuit. Burns & Jain are intimately familiar with the relevant codes and insurance policies regarding premises liability. We also have relationships with premises experts – architects, engineers, and safety personnel – that often play an important role in examining and exposing safety violations. And we will work with your physicians to get a report regarding the extent of your injuries, the nature of the permanency, if any, and to testify in court. Was there ice, water, or any other substance or circumstance which made the stairs slippery? Were the stairs up to code for your area? We frequently hire an expert to prove code violations at the time of trial. Did the stairs have hand rails, and were they sturdy, or loose or broken? Were the stairs uneven, or of an improper length and/or height? Was there loose carpeting or rugs, toys, clothing, or other items on the stairs which contributed to your fall? Was lighting a factor in your fall? Many un or under lit stairways in Massachusetts have caused falls where we have successfully represented clients. If you answer “yes” to any of these questions, you should contact a premise liability attorney as soon as possible to determine whether or not you have a personal injury case. If a property owner is found negligent due to poor weather conditions, improper building, or refusal to upkeep the stairway, then they will likely be ordered to compensate you for time lost from work, medical bills, and more. Broken bones in the pelvis, hip, arms, legs, neck, back, from falling down stairs. Injury to the brain from falling down stairs. Wrongful death from falling down stairs. Will My Fall Down Stairs Case Go to Trial? Regardless of the degree and seriousness of the injuries, the landlord’s insurance company may not resolve the case, or may not offer a fair settlement. In those instances, we need to file suit. We will present your medical records and bills and lost earning evidence to the insurance defense trial attorney. We will also ask for “discovery” against the landlord. Discovery is when we submit written questions about ownership, maintenance history, etc. to the defendant to answer. We will also request documents including photographs, video, and any prior written complaints. We may check the town or city records for inspection reports. Once formal discovery is complete, there is another chance for resolving the matter short of trial. Your experienced injury attorney will advise you of each step. For those who suffer injuries from falling down stairs, the results can be very debilitating. In some cases, the injuries may never fully heal, and the victim may never return to the type of work that he or she did before. If the victim is a child, the injuries could cause physical and developmental issues that he or she will suffer from for life. In the case of wrongful death, a personal injury lawyer can help the family receive compensation to help pay funeral costs, medical bills, and permanent loss of income. 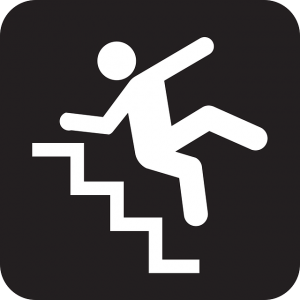 If you have been injured from falling down stairs, please call the experienced premise liability lawyers at Burns & Jain so we can help you determine whether or not you should file a claim or a lawsuit. Click here for more information on Handrail and Stairwell Accidents.